The entertainer Charles Thatcher gave his first New Zealand performance at Shadrach Jones’ Commercial Hotel in Dunedin. The Bristol-born tenor was handsome and charismatic, but prone to religious fervour and drinking bouts that ended in fisticuffs. 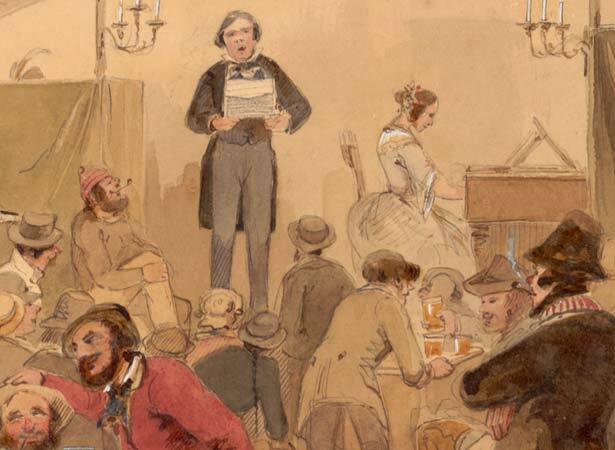 By 1862 he had spent nearly a decade on the Victorian goldfields, writing and singing topical songs with familiar tunes. His wife, ‘Madame Vitelli’, complemented his ditties with sentimental ballads. In February 1862 the couple and their son moved to Dunedin, which was booming after the goldrush at Gabriels Gully the previous year. More than 600 men paid 2s 6d (equivalent to about $14 in today's money) to attend the Thatchers’ first performance, in which the star turn was the barbed songs about local matters Charles had written during their 10 days in Dunedin. Thanks in part to a ‘great reduction of prices’ they continued to attract good crowds, performing fresh material nightly. Thatcher commented astutely on the tensions between Dunedin’s founding ‘Old Identities’ and nouveau riche businessmen such as Jones. In 1862, well-heeled Dunedinites had many entertainment options, including diverse dramatic and literary performances. The Thatchers received much better notices than those given the ‘decidedly inferior’ players who were performing at the Princess Theatre at the same time. Recitals by a ‘Chinese Singing Duck, lately belonging to the Emperor of China’, were promised but failed to eventuate. In this era ducks were persuaded to ‘sing’ by gradually heating an iron plate to which they were surreptitiously fastened – a scam which sparked riots on the Victorian goldfields when it was revealed. By late March 1862 the entrepreneurial Thatcher had a sideline printing the cards for horse races at West Taieri. Augmented by more performers, the Thatchers left Dunedin in July for a colony-wide tour. This culminated with a six-month residency in a hotel they bought in the newest goldrush centre, Queenstown. The couple returned to Victoria in August 1863 but were back in Invercargill at Christmas for a two-year tour during which they entertained British troops in south Auckland and diggers on the West Coast. After a third visit to New Zealand in 1869–70, Thatcher and his family returned to England. We have 12 biographies, 4 articles, related to Charles Thatcher gives first NZ performance.